12/24V Vibrosonic horns are the loudest horns! Ideal for cars, trucks, buses. Available in single and pair models. We offer a wide range of Truck Horns to our clients at industry leading prices. Our range is tested on the quality parameters of sound pressure level, water sealing, operating voltage, high voltage and corrosion resistance and offers high performance with low maintenance. Moreover, our range is well known for the long service life and easy installation. Our organization has come up with an extensive array of Winton Pair Black Horn. The offered horn is quality assured. 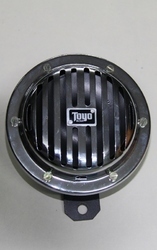 The offered horn is designed for trucks. They are elite and quality tested against many quality norms. They are available in many norms. Too, they are cost effective too. 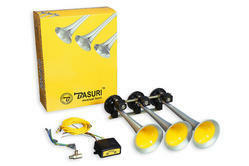 Customers can buy from us a wide range of Automotive Horns for Motor Bikes, Cars, Tractors and Trucks. Owing to their excellent and uninterrupted honking sound, these are acknowledged by our customers driving all kinds of LMVs and HMVs. The frequency at which these horns operate is suitable for the human ears, therefore these horns do not produce irritating noise.